What would your pet’s New Year’s resolution be? With the beginning of a new year, we all seem to find things we would like to change or improve upon in 2017. I have often wondered if our pets could make New Year’s Resolutions ……what would they be? Of course, just like their human family members, I am sure a healthier lifestyle would be one of the top three. Now what would that mean for our pets. I would say changing their diet to be more digestible and nutritionally balanced product would be a top priority. No different than our children, if it were left up to our pets, they would encourage us to look at what tastes great and pleases their palates. Not even considering the number of calories or the amount of fat in each product. We recognize that higher calories usually means better taste. They would possibly choose canned formulas over dry diets. They would look for the treats that taste great and have no nutritional value. Sounds familiar doesn’t it? Of course they would love to have more exercise since that would allow them more time with the people they love and adore. That exercise could come with a brisk walk every morning or wrestling at the end of the day. In their minds it all would be great because they get to be with their people! They would probably strive to get along with others. Again that seems to be a common thought amongst their 2 legged friends. Relationships are key in all circles of life. Our pets have stress and anxieties about meeting new animals as well as new people sometimes. Wouldn’t it be great if we could change those dynamics with a snap of a finger even in our own lives? Find ways to express ourselves without offense to others. Be more honest and open with people without fearing that this would affect the relationship. Pets use body language when interacting with other animals and these social clues are universal in the their world. If the ears are pinned back and the hair is raised, there is no mistaking what this pets body language is saying to the other in the area. Do not approach. Stay back. I am not your friend. Being able to read each other that quickly could sure save some heartache and frustration in our world as well. Enjoying life to it fullest certainly would be a priority. What else do pets have to do each day but love their life? I have often said that if reincarnation was something I believed in, I would want to return as a house cat. What a life they have. They never have to go out in the cold weather. Lounging around basking in the sun pouring through the South windows. Unlimited food set out daily and even someone to clean their box. What a life it would be. For our dogs it is so easy for them to find joy from our rising every morning to our return at the end of the day. Barking at the cars that pass by our home to lounging on the couch waiting for that moment when you walk back into their home. Yes, I mean their home. It is their territory and they decide often who is welcome and who is not. I cannot tell you the number of times a client has remarked that their pet(s) do rule the roost. “I get growled at for trying to come to bed.” “My dog doesn’t let me sit in my favorite chair.” “My cat only allows me to sit on the sofa.” “My pets tell me when it is time to eat.” Of course I know that with these comments, this pet is lucky to have a forever home and will never be without a large dose of love and attention. So as you look forward to 2017 and hoping it will be a better year than 2016 in some way we all need to remember that each day is a gift to be appreciated. We look back at 2016 and see some things that maybe we should have done differently but with a new year ahead anything is possible. Strive to make your pets New Year’s Resolutions come true and I am sure with each new day there will be plenty of joy and love to go around. Thanksgiving 2016 has come and gone. This time of year is always a great time of reflection for me on all the blessings in my life. Of course those blessings always include family and friends that surround me each day and give me purpose in my life. The simple fact that I have a job which supports our family and allows me to practice close to home is something incredible to be thankful for. Dr. Jim Pottebaum and our staff of Stephanie, Mary, Ann, Kristal, Jessica, and Kaylee help me be the best vet I can be. I often forget to express to them how grateful I am for all they contribute to my daily happiness. This year brought about a lot of reflection for me and I found myself thinking about clients and patients that I feel are blessings to me every day at Winterset Veterinary Center. Each and every day of work is unique and challenging because of those cases that come through our doors. The career of veterinary medicine doesn’t allow me to ever become bored with what I do each day. The emotional changes that I feel in a typical day at work range from joy at holding a new puppy or kitten and feeling the warmth of their tongue on my face and smelling that sweet baby breath. To deep despair, as I enter the room with a long time client knowing that today is the last day I will be looking into those loving, trusting pet’s eyes. Of course, there are those pets that despise me long before I even get close to them. I sympathize with their owners knowing how stressful it must be for them to bring their pets to see me. I try to reassure them that it is not their fault when their pet misbehaves in the clinic. Changes in a pet’s routine are a challenge for many and how they respond is as varied as the breeds we see each day. As I reflect on this past year, I can recall cases that brought me to tears at the unexpected loss of a pet, or the joy of seeing a pet that recovered against all odds, or the relief knowing that I had saved that pet from certain death, had I not stepped in at that exact moment. None of these experiences are more important than the other, but each of them has made me a better person and veterinarian. I thank our clients for entrusting their family pets to our care. 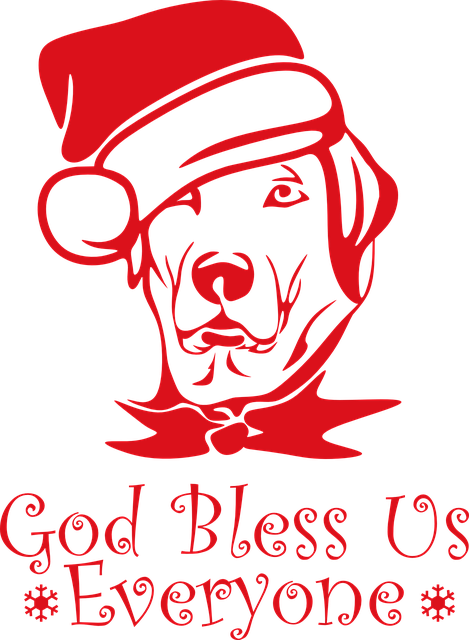 So as we reflect back on our Thanksgivings, we also look forward to the biggest giving season of the year, Christmas. The Winterset Veterinarians are collecting donations to help feed the hungry pets in Madison County. Many families struggle during this time of year to provide for their families, say nothing about feeding their pets. 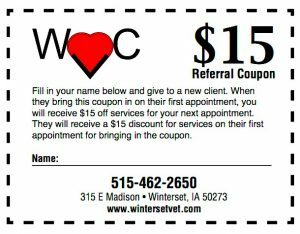 The Multi-Purpose Center gladly accepts donations as will each of the veterinary offices in Winterset. A small bag of food or cat litter or a few toys can mean a better Christmas not only for those families but also their pets. If we all do our part in giving of our resources to those less fortunate it can make a huge impact. Please consider donating today and brighten the days that lead up to the most joyous time of the year. 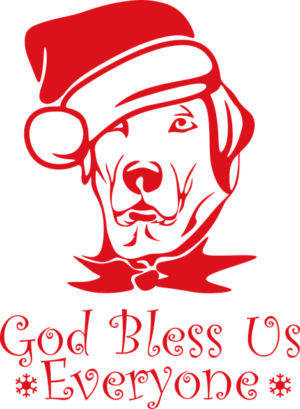 May you all have a very blessed Holiday Season and as we look towards 2017 may we always find the good in everyone we encounter and remember to be thankful. As you can imagine, one of the toughest things about being a vet is saying “no” to stray pets. We get a lot of calls about pets found or lost each week at Winterset Veterinary Center. These calls are extremely frustrating for those that have lost or found the pet and also for our practice. Madison County does not have a shelter that accepts dogs and cats that have been found or people that have decided they can no longer care for the pet and need a place to surrender them to. People find animals along the roads of Madison County. Being concerned for their safety, they pick them up and make a call to ask where they can drop them off for safe keeping until owners can be found. I am sorry to say these people have very few options for these dogs and cats. This presents a lot of issues for all parties involved. Therefore, I want to make some suggestions to all pet owners that will possibly ensure your pet, if lost, can get home as quickly as possible. First of all, we as veterinarians cannot tell you why your pet ran away. Pets do crazy things sometimes. Even if they have never run and they are 8 years of age they can still decide on the spur of the moment to run away. Having a pet neutered or spayed can help reduce the incidence of running but they run for other reasons as well. Maybe they have found an alternative food source on an adventure or they have found other animals or people to play with. Maybe they are trying to follow you and find where you go every day. Perhaps they have a fear of noises or thunderstorms. Maybe they took off after a wild animal or bird. Perhaps they are just following their nose and tracking who knows what. Whatever the reason is, you must be prepared for it. Every pet should have a tag or collar with the owners name and phone number at the very least. A rabies tag is not appropriate identification. A rabies tag is proof that a vaccination was given at some time. It does have a clinic name where the vaccination was given but often when dogs or cats are found it is after business hours and there is no way to track that information until the clinic opens for business again. 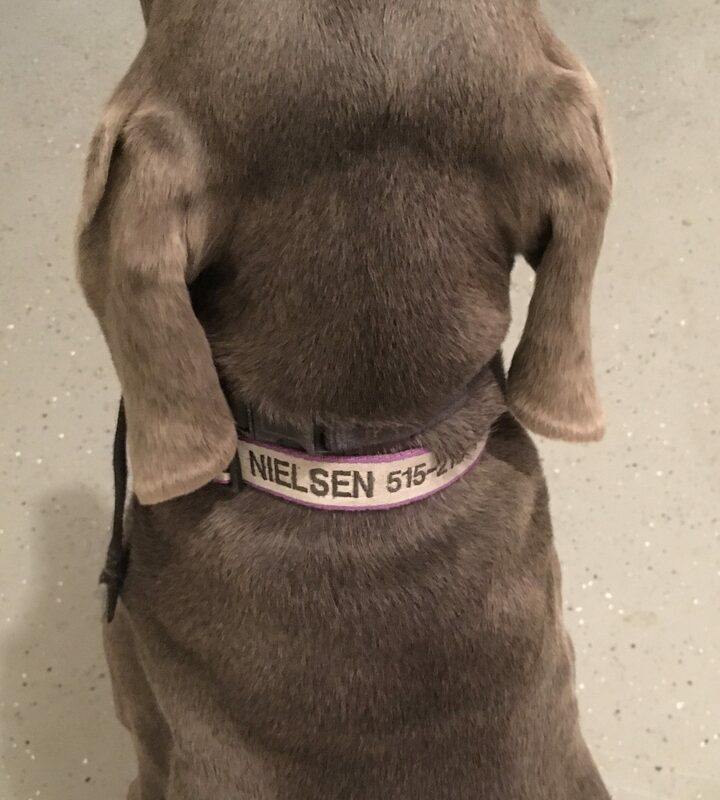 Large dogs often lose dangling tags, so consider a collar with your information embroidered on the collar or a tag that rivets to the collar. A company that does a great job on collars is www.orvis.com. They have a large number of collar options and the embroidery is very easy to read even from a distance. I once got a phone call from a service man who had come to our home to deliver something. I asked him how he got my number and he said from your dog’s collar. I have used these collars since 2007 and have never been disappointed. They even have collars that reflect light to help keep pets safer at night. It is important to have a picture of your pet that would be easy to access in the event your pet has been lost. We have found that social media has been a great way to alert people to a lost or found pet. The picture should be age appropriate and close enough to see markings on the pet. If you find a pet and can take a picture and post it, that is extremely helpful. Attempt to see if it is a male or female. Telling where the pet was found can be beneficial. If you find a pet along the road and are traveling out of the area it is best not to take that pet with you. The owners will not be looking for their pet in another city or state. There is a website called www.iowapetalert.com where pets can be listed as lost or found hoping to reunite them with their owners. This is a must do for all pets. It is not that expensive and when a pet is microchipped the reunion happens much more quickly. As of today, the chips do not have a tracking device on them. Maybe in the future the technology will allow this. So how does the microchip work? 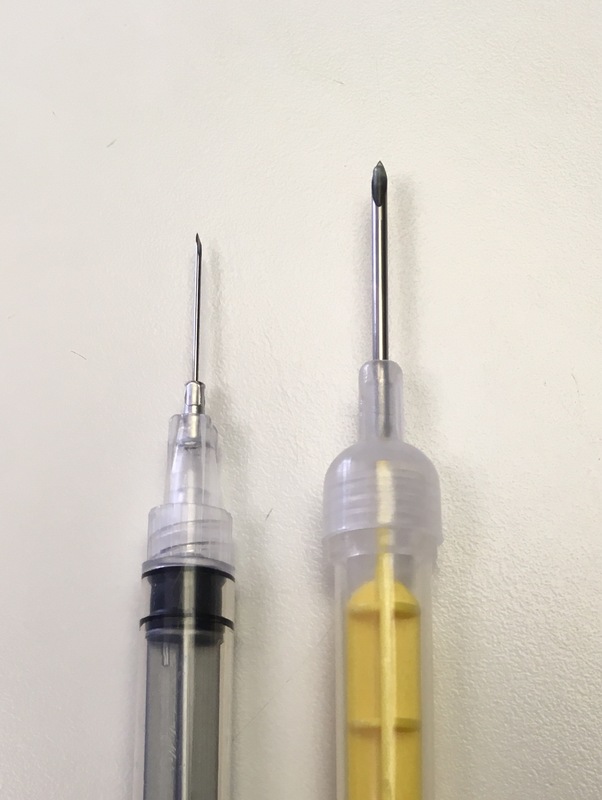 As you can see, there is not much difference between the microchip needle (on the right) and a vaccination needle (on the left). Many microchips today are 15 digit universal chips. 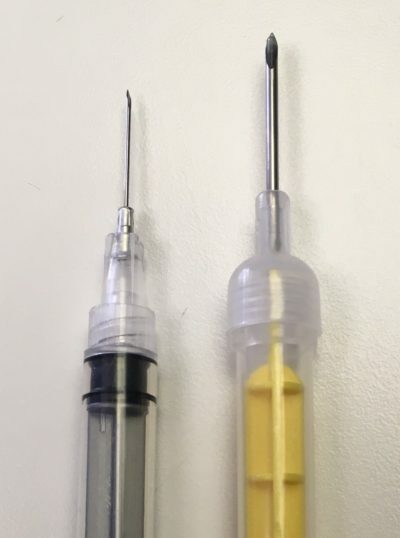 They are placed under the skin at the shoulder blade with a syringe very similar to a vaccination. It can be done in the exam room with the pet awake. Many chips have non-migration properties today. This is extremely important. Earlier chips moved under the skin and therefore made it difficult to find them when scanned. The universal chips can be read in any country around the world. If your pet has a microchip, make certain you know the microchip number and manufacturer. Most companies encourage the pet owner to register the microchip number. At Winterset Veterinary Center we purchase pre-registered microchips. This allows us to enter all the contact information and set up an account with Home Again the same day we place the chip. 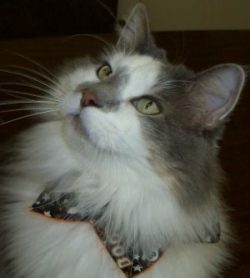 The American Animal Hospital Association (AAHA) started a website called www.petmicrochiplookup.org. If the company your microchip came from does not cooperate with this website, I would encourage you to call them and ask why. A microchip is of little use to you if your contact information is not available quickly to the person who found your pet. The above website allows you to put the microchip number into a search box and they will then give you a number to call where more information can be found. Your personal information and that of your pet is protected. It is also important to know that the microchip information cannot be put into anyone else’s name without your signature. This is important in the case of a theft. Most microchips do come with a tag to put on the pet indicating they have a microchip, but as with any tag there are times it is missing or unable to be read. That is why it is so important to scan any pet that has been found to make certain they do not have a chip. We have heard some amazing stories of pets reunited with their owners even after many years have passed or miles have been traveled. If you know your pets microchip number but do not know if you have registered it or not, here is a test you can do to find out. Go to the above website and type in your microchip number. It then will give you a number to call for further information. When you make that phone call you should discover that your personal information is connected to your pet and that all the information is correct. If that is not the case, you need to ask how to update the information so in the event your pet is lost there will be fewer delays. Most pets adopted from shelters are now microchipped. Many breeders microchip puppies prior selling them. 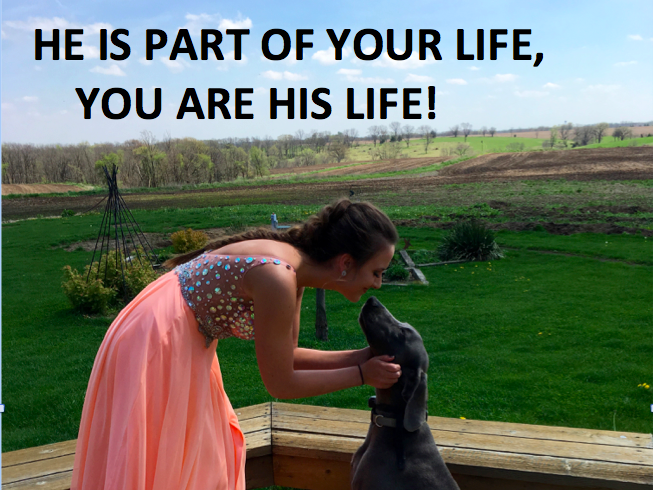 Losing a pet is one of the most devastating situations for a family. Doing these three things can help you be reunited with your pet in the event they leave home unexpectedly, because it can happen to you!